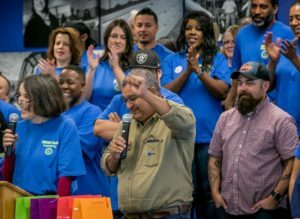 Flanked by eighty-three newly minted Organizing Stewards, the IBEW 1245 Advisory Council and Executive Board, a delegation of Salvadoran Electrical Workers Union (STESEC) joined together with a room filled with Local 1245 members to cement a newly launched sister relationship between IBEW 1245 and STESEC. STESEC is the utility union in El Salvador that represents 1.600 electrical workers in generation and transmission, including one of the largest geothermal plants in the region, known as LaGeo. IBEW 1245 Business Manager Tom Dalzell extolled the five-person STESEC delegation, which included a lineman, three system operators and a warehouse/materials worker, all of whom are elected members of the STESEC Executive Board. 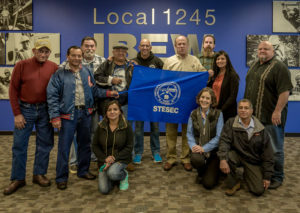 Fredy Lopez, the spokesman of the delegation from STESEC, stated that the labor struggle in El Salvador correlates with the legacy of the struggle in the early days of the IBEW and U.S. Labor Movement. 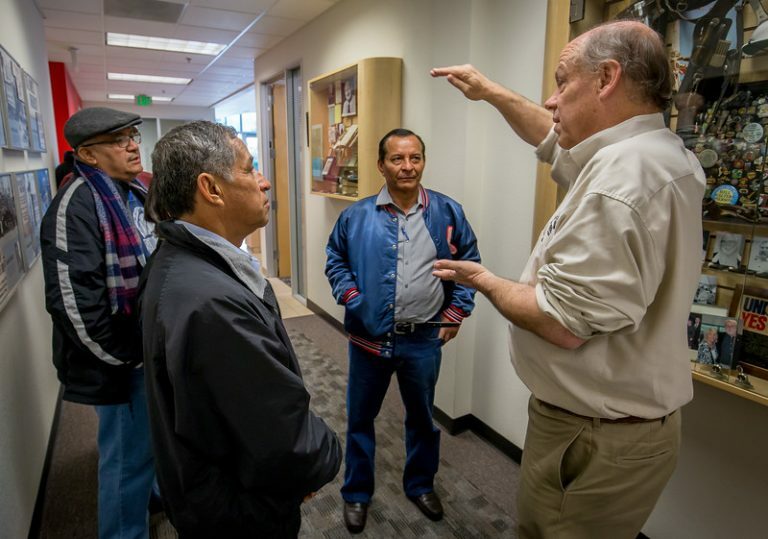 Lopez detailed how the union fought back against an extreme ring-wing anti-worker regime. Four out of the five STESEC leaders who came on the trip were among those fired. During that time, some of the union’s leaders were thrown in jail, and later exiled from the country. But now, there’s a new government in El Salvador, and the workers are finally able to freely advocate for better wages, benefits and working conditions without fear. They have negotiated a strong contract, and have outstanding levels of participation, with 100% of union members voting in union elections. 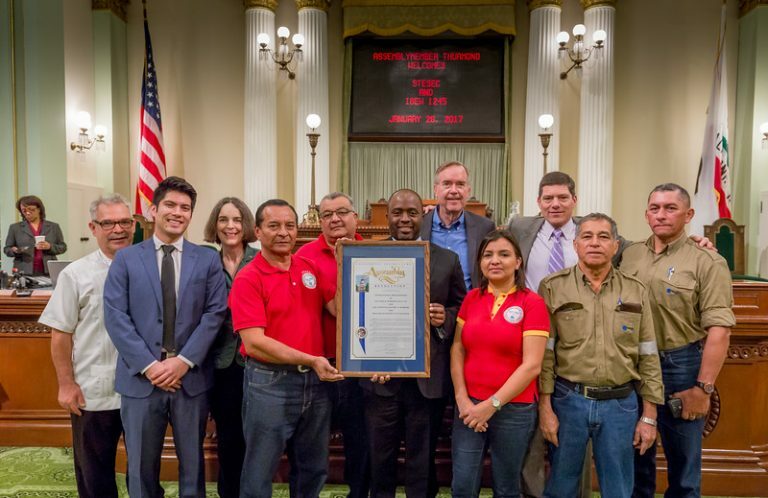 They have also made notable legislative progress, including the first federal minimum wage increase in 20 years to benefit low-wage workers, who they refer to as “those without voice in our country.” Additionally, STESEC has been actively supporting and promoting the role of women in the trade union movement. In 2014, IBEW 1245 launched its first sister relationship with the electrical workers of Suriname. 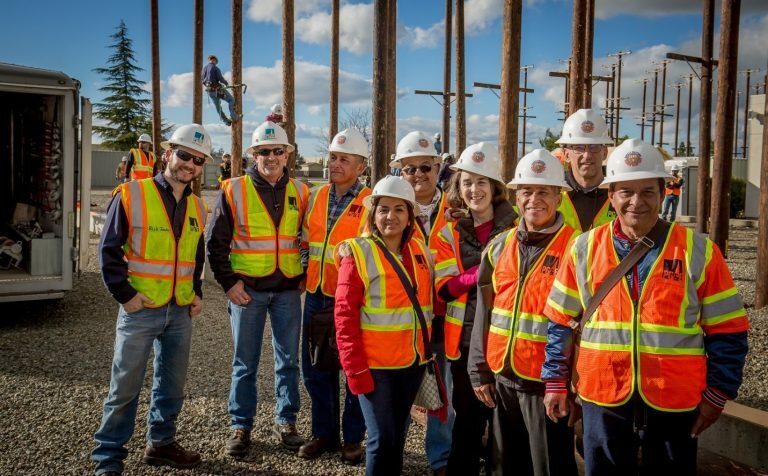 Spearheaded by Brady Hansen, a lineman out of IBEW 77 in Washington State, IBEW 1245 sent teams of linemen, tree trimmers and safety experts to work with our counterparts to teach them basic skills. 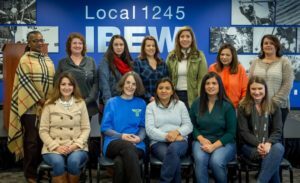 The sister relationship between IBEW 1245 and STESEC was initiated in July of 2016. Our first contact was made through Jose Artiga, Executive Director of the SHARE Foundation, who introduced me to STESEC leaders in December of 2015. In July of 2016, IBEW 1245 Assistant Business Manager Bob Gerstle and I met with the STESEC Executive Board, General Secretary Rene Giron, and rank-and-file members in El Salvador. We visited power plants in Soyapango, Nejapa and Ahuachapan, and learned that, unlike in Suriname, the Salvadorans electrical workers’ skill sets are comparable to those in the US power industry. The big difference centers around access to training and resources. 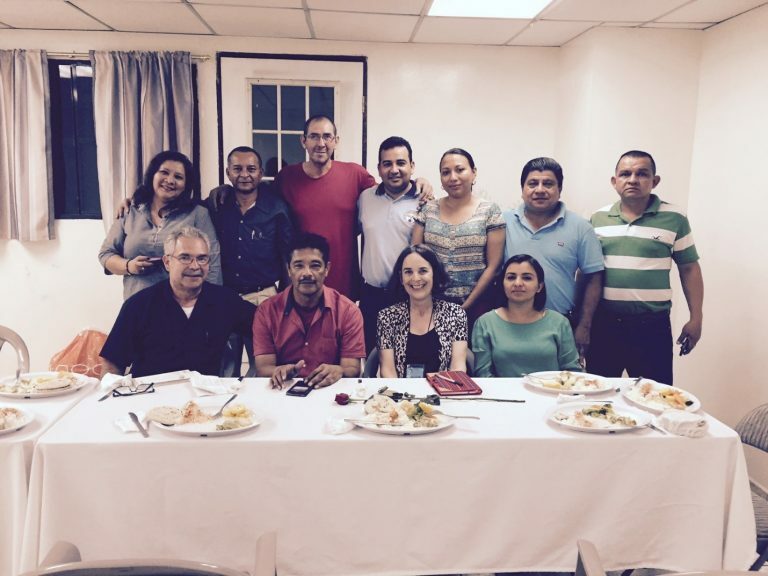 First Meeting with the STESEC Executive Board in El Salvador, December 2015. STESEC expressed a strong interest in learning more about IBEW 1245’s training programs and union-building projects, including the Organizing Steward program. They introduced us to Architect David Antonio Lopez, the President of the Hydro-Electric Commission of the Rio Lempa of El Salvador, and the CEL Group, which is an amalgamation of public and private power companies regulated by the government. Lopez expressed great desire in working together with STESEC and IBEW to find ways to advance best practices and enhance training, and we began to make plans for STESEC leaders to come for a visit to the United States. During their week-long stay in the United States, the Salvadorans visited PG&E control centers and training centers in Vacaville, Livermore, San Ramon and Concord, as well as the NCPA geothermal plant at the Geysers in Lake County. At the NCPA, Local 1245 members and plant managers provided an overview of the geothermal industry. The Geysers represent the largest geothermal plant in the world. “The size of the plant, the usages of byproduct, such as sulfur, for agricultural fertilizer, and the similarities in technology were striking,” said Operator Felipe Hernandez. It was also the delegation’s first experience seeing snow! They met with Senator Skinner and Assemblymembers Thurmond, Medina, Salas, and Gonzalez, as well as with Senate Pro Tem Kevin De Leon, who had recently returned from an official visit to El Salvador himself. In San Francisco, the delegation met with newly elected Supervisor Hillary Ronen, and were presented with a Certificate of Honor. They also met with the Staff of Congresswoman Nancy Pelosi. But for the STESEC delegates, the greatest highlight of the visit was spending time at the Local 1245 union hall, where they got to experience both the place and the people. STESEC does not have a physical union hall of their own. The union has negotiated with the employers for a specified number of days per month for union activity, but most of their union work is conducted on their own time. Several members of the STESEC Executive Board work the night shift so they can spend the day doing union business. Meeting the Local 1245 staff and leaders left a lasting impression on them. 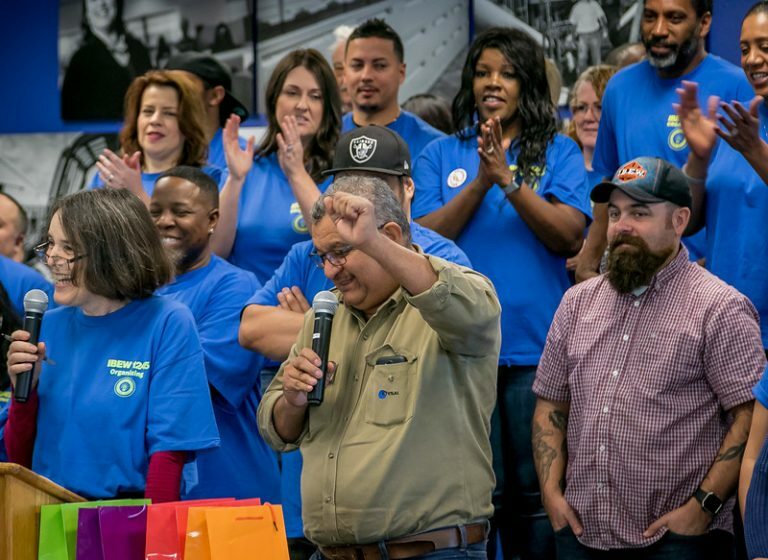 “1245’s investment in training younger members is vital to creating a dynamic team of organizers and growing the labor movement,” Santos added. IBEW 1245 President Art Freitas welcomed the delegation on behalf of the Executive Board, and the delegates reiterated their gratitude to Tom Dalzell, the Executive Board and IBEW 1245 as a whole for initiating the sister relationship and building solidarity, which both unions view as a core value of the Labor Movement. The delegation also appreciated the opportunity to join the Organizing Steward orientation, where they heard about the recent union organizing victory at BGE, and were inspired by their successes and dedication. Organizing Steward Nilda Garcia gave Carla Silva her pin of Rosie the Riveter which states “A Woman’s Place is In Her Union!” In exchange, Carla gifted Nilda her satchel with the STESEC insignia embroidered on the flap. 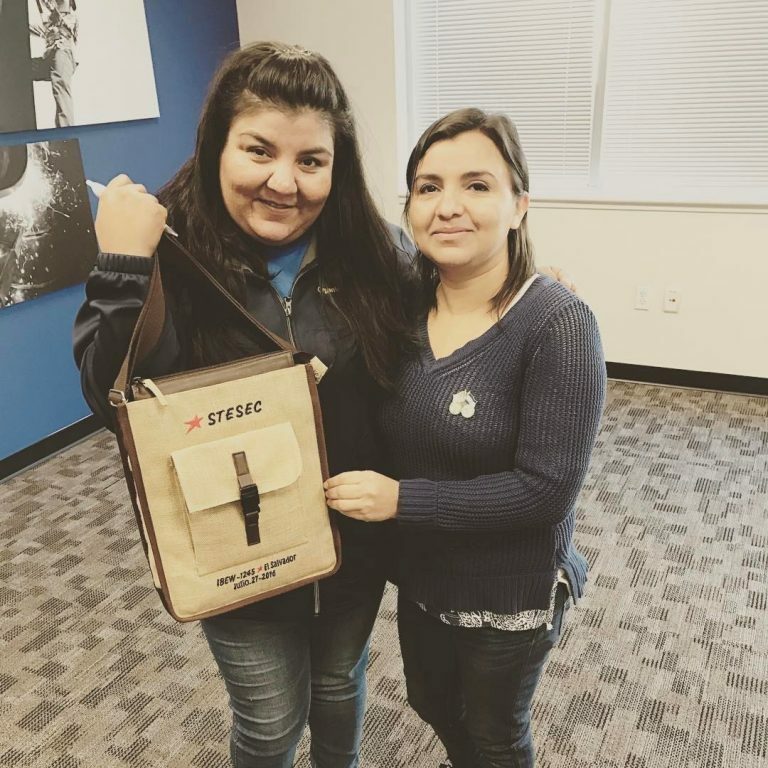 Organizing Steward Nilda Garcia (left) gave Carla Silva her pin of Rosie the Riveter which states “A Woman’s Place is In Her Union!” In exchange, Carla gifted Nilda her satchel with the STESEC insignia embroidered on the flap. The culminating event was the Advisory Council meeting. 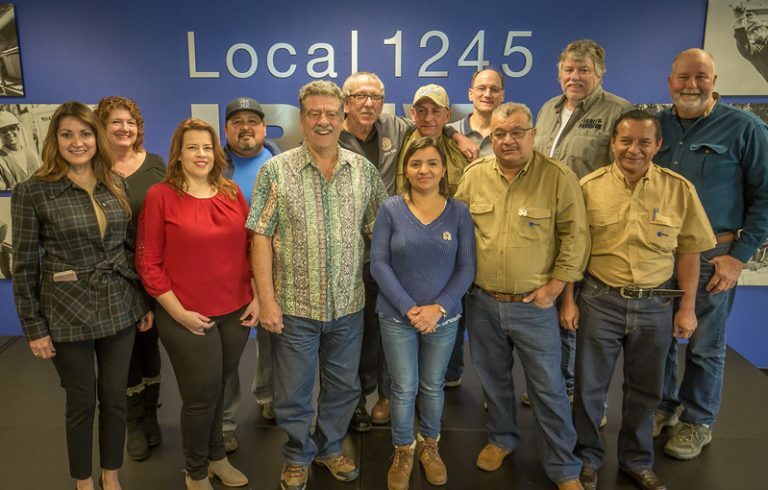 The Local 1245 Executive Board, Advisory Council, staff and Organizing Stewards listened to the powerful story of struggle, solidarity, and victory. Fredy Lopez reiterated his call for unity and solidarity, with a special message for the dozens of young stewards who stood behind him. “You are the future, you are the hope, never give up on the struggle, there is nothing we cannot do if we are together. Si se puede!”he said. That message really resonated with the Salvadorans. “One of the most important lessons of this exchange was when Tom Dalzell reminded us the union is not a business. 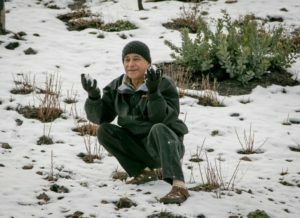 It is struggle and sacrifice,” Said Felipe Hernandez. In the coming months and years, our relationship with STESEC will continue to grow. The next step will be a visit to El Salvador in July with a group of IBEW 1245 leaders.